With campaign season in full tilt, Americans are being inundated with rhetoric regarding the various tax proposals touted by President Obama and Governor Romney. Given that these discussions usually involve paeans to the middle class and promises to keep their tax rates low, one tax in partcular has received surprisingly little attention: the “penalty” levied on all Americans who do not buy health insurance. 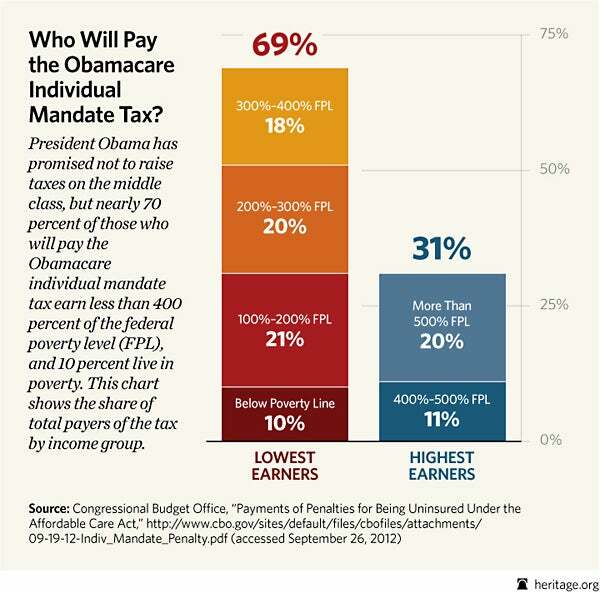 As shown in the chart above, this new tax – defined as such by the Supreme Court, which ruled it constitutional under Congress’s taxing power – hammers not just the middle class, but roughly 600,000 Americans whose incomes fall below the federal poverty line, according to a recent report from the Congressional Budget Office. Despite claims made by Obamacare’s advocates that the law will help middle- and low-income Americans, CBO’s table reveals that the distribution of the tax falls heavily on those making less than 400 percent of the federal poverty level (FPL)—meaning the majority of this new tax falls on the very people the law was supposed to help. For instance, a family of four making about $24,600 per year, the projected FPL in 2016, could be subject to this egregious tax penalty. Regardless of whether or not these 6 million Americans want health coverage, they are going to pay a hefty tax and still won’t have it. Moreover, the individual mandate tax is only one of Obamacare’s 18 new or increased taxes and penalties that will cost Americans $836 billion over the next 10 years.